The UN released it’s latest Human Development Report (pdf) last week. It’s the 20th year they’ve produced the report, and it shows nothing but progress on the Human Development Index, the report’s metric of wellbeing composed of income, life expectancy and literacy rates. This is something they quite rightly celebrate, before exploring the changes in a variety of ways. There are new tools to break the HDI down to show inequality, and some interesting conclusions on economic growth. If you compare changes in the HDI and in GDP per capita, you get a strong correlation – but then a third of the HDI is income, so that’s not surprising. 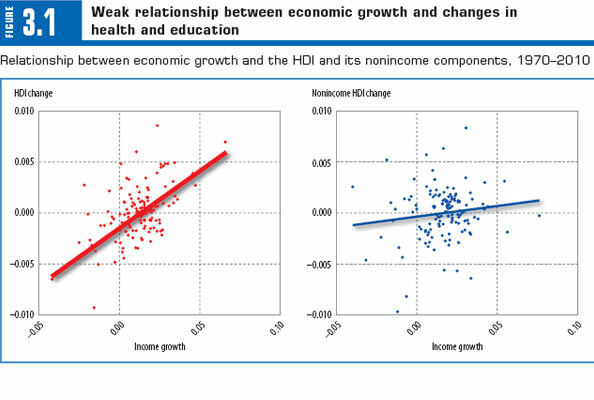 The graph below right shows schooling and health without the HDI’s income component. Comparing this with GDP per capita over time, “the correlation is remarkably weak and statistically insignificant”, to use the report’s own words. There are a variety of reasons for this. One is that there is a lag as rises in income translate into improvements in healthcare and education. And once countries are developed, there are fewer gains to be had in wellbeing. As technologies and new medicines filter down, it’s cheaper for poorer countries to adopt them than it was for those who developed them, meaning income is less important.